Remember the next generation mobile phone Droid Motorola's latest output is called the mobile social networking? According to the news, cell phone called the Motorola Devour it is available from February 25 to 99 dollar price. After rumors crowded discussed since a few months ago, finally one of the original retail stores United States, Best Buy announced officially the availability of Motorola Devour in the market. If you previously informed Motorola Devour will be available on the market in March 2010, but Best Buy has officially announced that the Motorola Devour will be available on 25th February. That means, Motorola Devour countless faster landed in the market from the planned schedule. 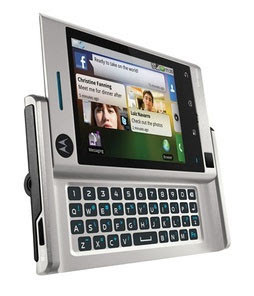 And the most by surprise again, Best Buy said that they will sell the Motorola Devour costing only 99 dollars. That way, Motorola Devour is far cheaper than the original estimate that reportedly will price 149 dollars. But we do not get information about availability in Indonesia. But if the note from the information available, it is likely there will be Motorola Devour in Indonesia. But still, you have to be patient waiting for the presence of mobile social networking in Indonesia.